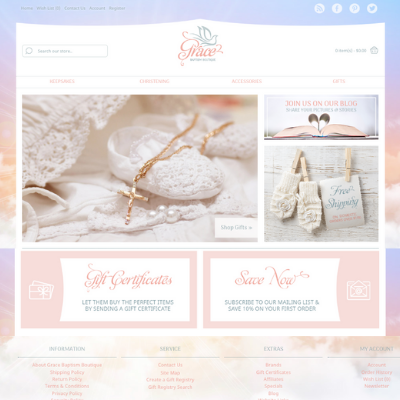 Concept: Help proud families make beautiful memories on the day of their little one's baptism with this beautifully designed online specialty boutique - Introducing GraceBaptismBoutique.com! Online shoppers can shop at this new design-ready, niche market internet business for memorable keepsakes to be cherished for years to come, exquisite gowns and adorable suits to be worn during the christening, must-have accessories for the magical day, plus gorgeous gifts to give! This website will be loaded with an assortment of all drop ship products which allows you to have more flexibility than holding product inventory. The project manager will establish the initial vendor relationships and load the first 100 products to the site to get started. Once you purchase the website you will have the opportunity to select the remaining 200 products to be loaded. GraceBaptismBoutique.com has an adorable 100% responsive design. It offers shoppers a user-friendly shopping experience as this website offers easy to navigate categories and an eye-catching design that is sure to give shoppers a warm welcome! You will be able to reach out to your customers through the connected social media pages, blog, and newsletter. You will not only be able to market the beautiful baptism products through these various outlets, but you will also be able to share inspirations, tips, exciting news, sales and more! New to ecommerce? No problem - This internet "business in a box" created by Pure-Ecommerce offers you the "tools" you need to get started in the online marketplace. You'll receive step-by-step ecommerce consulting during the first year of your business to help you set up, learn to run and market your new internet business. You will receive access to our eLearning Library to access learning materials 24/7. Need a little extra help? Then you can upgrade to platinum to receive additional services to jump-start your new business! Do not wait - Register or log in to access our website pricing. We also encourage you to schedule your Introductory Call to discuss any questions you may have about starting an online business. Let's work together as you become the owner of this beautiful niche market online business! VintageStyleWalls.com designed by Pure-Ecommerce Responsive Design Website Part of ..